If I’m stranded on an island and I could only bring one kitchen appliance, what would it be? 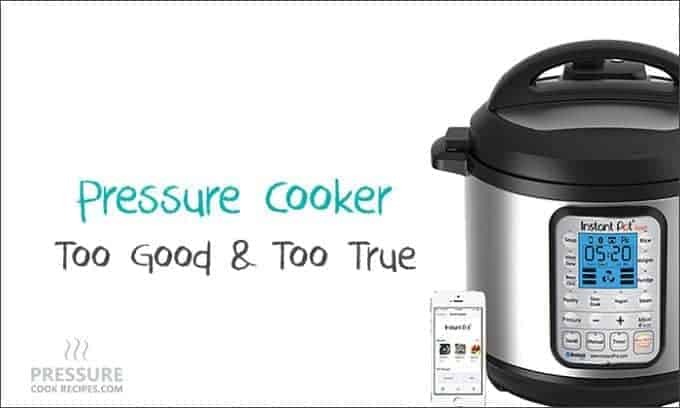 A pressure cooker! hahaha 😀 No, I’m not kidding. Modern day pressure cookers are super safe to use, so you don’t have to worry about exploding chickens, really. If you haven’t started pressure cooking your food, you’re totally missing out! You’ll see why. If you want to know more about pressure cooking and pressure cookers, hop over to Cooking With a Pressure Cooker. Who wants to cook for hours after a long day of work? Not me! Pressure cookers cut short your cooking time by up to two-thirds. They should really be renamed fast cookers. If you live in places at high altitude and you’re not pressure cooking, start NOW. It’ll save your life. For example, it took us less than an hour to cook dried beans in the pressure cooker compare to overnight soak + 2 to 3 hours of cooking on the stove. It takes 4 to 8 hours to make goat stew in slow cookers, but it only took us 30 to 40 minutes in our pressure cooker. Fall off the bone baby back ribs? Just under 25 minutes. Oh, YES Baby! If you purchase an electric pressure cooker like Instant Pot IP-DUO60 7-in-1 Pressure Cooker, you don’t even need to buy other appliances such as slow cooker, rice cooker, or steamer. Was eating healthier ever your new year’s resolutions? It was ours. That’s why we’re pressure cooking. Hey, it’s never too late to start now. There’s a myth that the high heat used in pressure cooking kills the vitamins and minerals. We’re by no means food scientists, but it’s proven from scientific research that pressure cooked food retain more nutrition value than boiling and steaming. Not only because the cooking time is shorter, but it’s able to trap the nutrient from escaping through the steam. More delicious food?! Ok, we’re done. I’m sold. The extra high heat used in pressure cooking promotes caramelization and browning of the food. This brings out the depth and complex flavors of the food AND creates a deliciously rich broth at the same time. Quite different from your regular steamed food. Yum! One of the reasons why we love our pressure cookers is that you can EASILY cook moist and fall off the bone meat in a short time. Yes, it works on cheap tough cuts of meat! Cooking in a hot kitchen in the summer is like working out in the sauna room. Ugh…Cook with a pressure cooker? Problem solved. The pressure cooker will not heat up your kitchen when it’s cooking. Plus, if you’re using an electric pressure cooker, you don’t even need to stay in the kitchen while it cooks. Perfect for the hot summer. We know people who use their pressure cookers on RVs or boats. They even bring it to camping! Since the pressure cooker is tightly sealed when cooking, you don’t have to worry about filling the house with a certain smell of food. We’ve been there. After a long day of work, all you have is frozen meat and hungry kiddos. No time to thaw but you don’t want to use the microwave? Throw it into the pressure cooker. What a lifesaver. Whew. It’s essentially hassle free if you are cooking with an electric pressure cooker. You set it and forget it. No babysitting required. Perfect for those with busy lifestyles. What more can you ask for when you can eat healthy and delicious food that is easy and quick to make?! That’s what pressure cooking is all about. Ready to buy a pressure cooker? Check out the top 5 brands of pressure cookers: Best Pressure Cookers.